PRODUCT DESCRIPTION: Liquid that uses Federally Exempt actives making it not harmful and safe for use around the home and garden. It works by producing an odor and taste which is disagreeable to a wide variety of home and garden animal pests. It works by producing an odor and taste which is disagreeable to a wide variety of home and garden animal and insect pests including but not limited to: aphids, beetles, chipmunks, curly tails, deer, ducks, frogs, geese, iguanas, leaf chewers, lizards, mealy bugs, rabbits, raccoons, skunk, spider mites, snails, snakes, squirrels, thrips, toads, white flies and more. WHERE TO USE IT: Spray PEST-RID thoroughly in all areas where animal pests bask, feed, are seen or there is evidence of their presence such as droppings, claw marks or chewed plants. This includes areas around trees, shrubs, flowers, vegetables, walkways, docks, roof tiles, pool decks, or any place where control is desired. 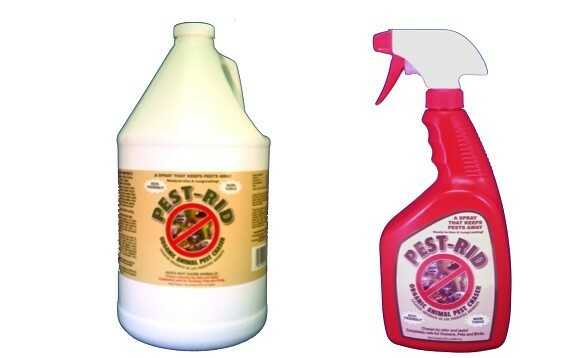 Be sure to use it in conjunction with PEST RID GRANULES when dealing with ground dwelling nuisance insects or animals.